We were coming from Vienna, driving to Salzburg on the A1, looked out the window and saw this big lake. “What, another lake?” I thought to myself, but the girls immediately pointed out the waterslides, mid and high-diving platforms and sailboats. Rog looks at me. I look at him. He takes the next exit. It’s outside Salzburg roughly thirty minutes. Perhaps we wouldn’t have stopped had it not been nearly 100 degrees as a heat-wave had hit that part of Europe, nor had we had an extra day on our schedule. We were so glad we did. The top three reasons to make the drive are activities, food and price. 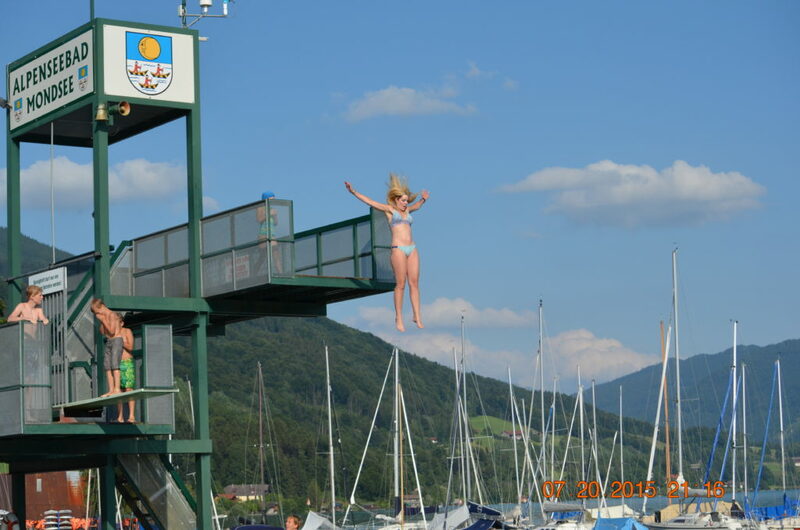 From sailing to swimming, the compact but highly fun waterpark and lakeside dining, Lake Mondsee is relaxed and casual, the antithesis of so many lakes in the area. 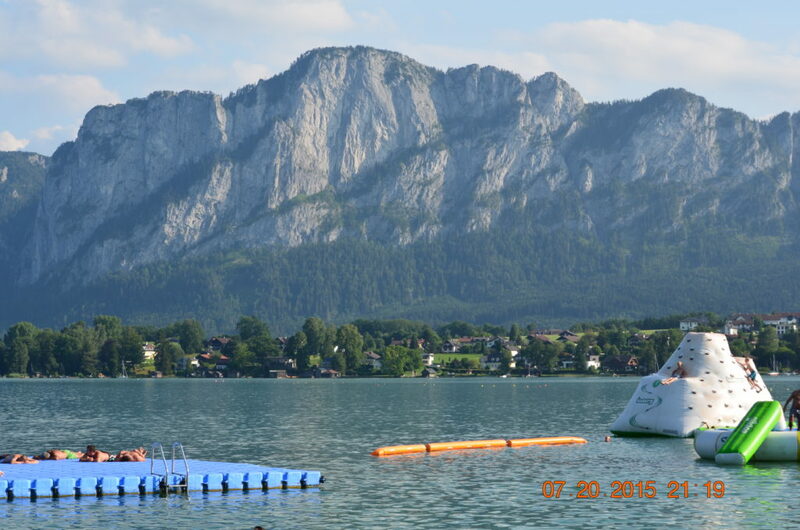 Unlike Area 47, which is more for thrill-seekers, Lake Mondsee, especially near the waterpark, is geared for families. The high dive platforms are fantastic. Unlike the US, no restrictions exist about age or level of sanity. 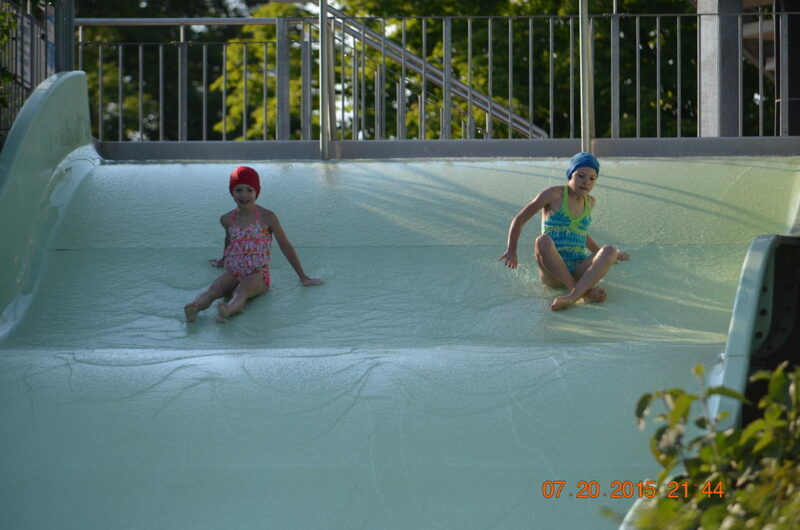 My 6-year-old launched herself off the mid-platform, about 15 feet up, and my older daughter, 9 at the time went off the 25 ft high platform. Like a numbskull, I did the same, but once did a handstand, landing flat on my back. Yeah, that knocked the wind out of me, and my ribs were actually bruised, which made for some painful walking the next few days. 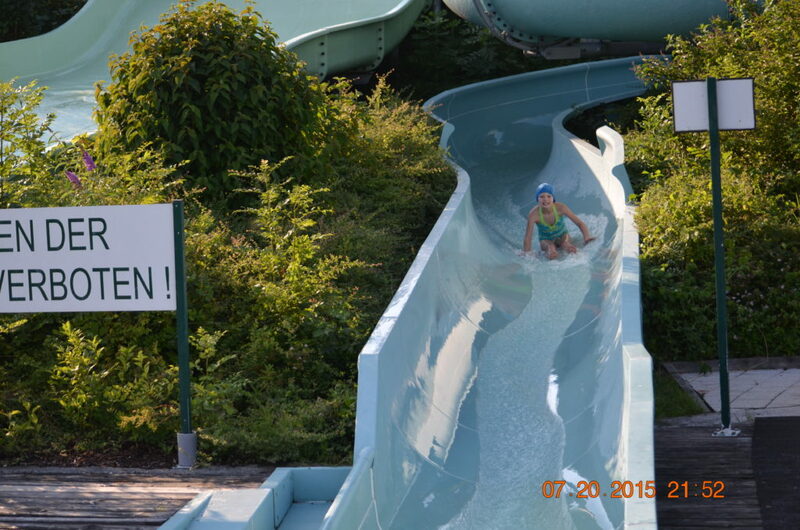 Waterslides are easy to moderate, not the screamers of Area 47. Even the adults were going up, down in and around. We would have rented a sailboat, but the wind was absolutely non-existent. Perhaps this upcoming trip we will get lucky and get on the water. Contrast this to Area 47, which is all about high-impact/thrill, daredevil and adrenaline junkies. As adults, we were completely drawn to Area 47, but the limit is age 12 for all rides and in the main area, competent swimming. 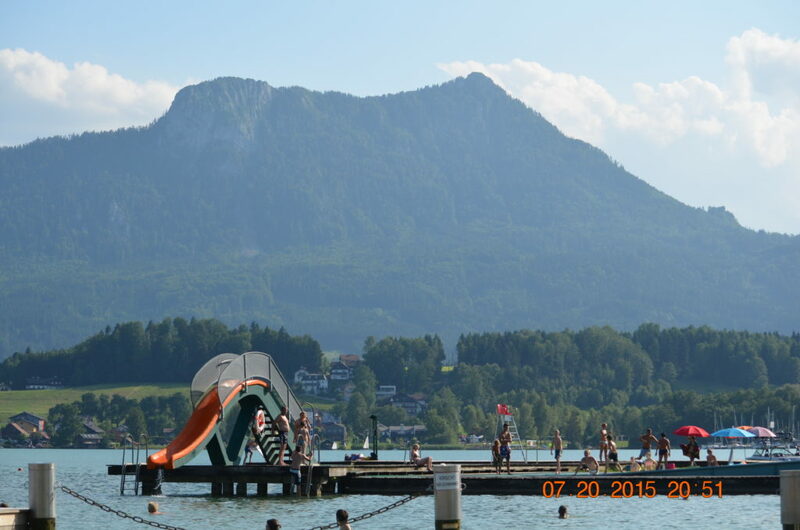 So, if your kids are younger, or you want a more relaxing experience, the Mondsee water park is the one to hit. Several restaurants of differing prices sit waterfront, the foot excellent (we went to two of the three). Traditional Austrian dining is mixed with hamburgers and French fries; all casual dining. Waterpark prices are low (less than $10 per person) for an all-day park pass, and the parking in the central area was free. One of the most consistent questions/concerns voiced about our jaunts to Europe revolved around language, and the reality we speak a few words of several languages, but none of them good. Our German is probably the best, and even that is basic. Our response is this: most of the Europeans speak better English than most Americans. It’s never been a problem, except when we are in the very inner parts of a country and stop at a restaurant. Usually, the owner(s) are older, and don’t speak a word. In those cases where the younger generation isn’t present, we simply look at the food on a plate, point and order. Easy! Hotels are plentiful, about 45 in the area, but a VRBO is a bit trickier. We tried finding and booking one six months prior to our next trip, and were out of luck. In general, the area does not lend itself to rental homes. We ended up booking two nights in Salzburg at the Hotel Turnerwirt. It’s small, quaint, local and right in the heart of the town, which is what we look for when we are going to be in and out relatively quickly. The price is also awesome. 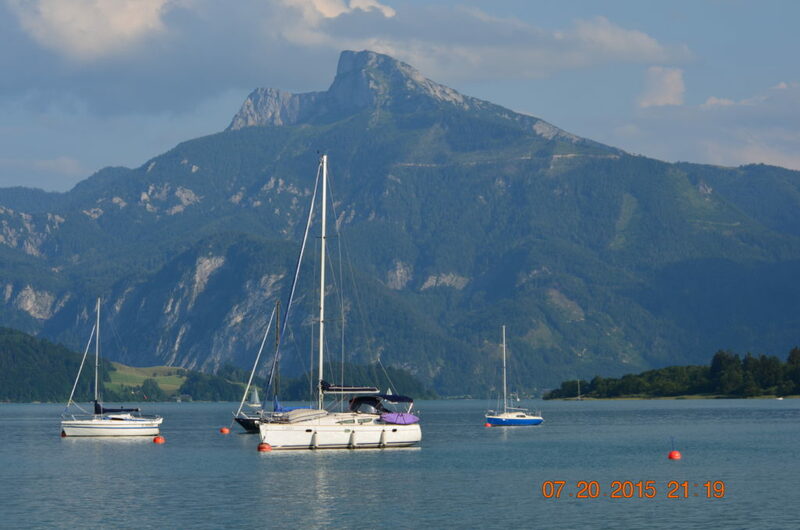 Since we found Lake Mondsee one afternoon, we decided to spend the night. Boy, that wasn’t fun at all. It was early July, and the only available room in the entire town was at a hotel which was really more of a cross between a hostel and a hotel. In other words, the lobby and rooms were fine, but the air conditioning barely worked and the rooms claustrophobic. Even so, we got up and out of the hotel the next morning, visited Fortress Hohensalzburg and the Mozart residence and then went back to the waterpark. 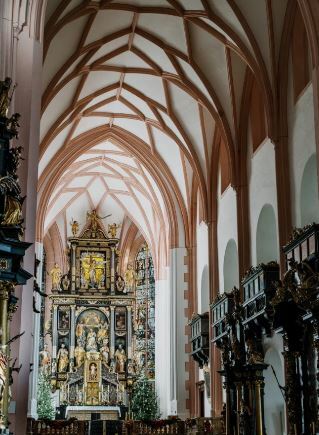 For those familiar with the Sound of Music, the inside of the Abbey is the setting for the wedding scene of for Maria and Captain von Trapp. This was about as close as I got to fulfilling the childhood dream of singing “the hills are alive.” It was a short, but worthwhile visit–but the significance, or at least my emotional attachment) was completely lost on my husband and girls.